Sometimes you’re deep in a toxic relationship and can’t see the signs. I know because it happened to me. It started at age eleven. I counted down the days until my 11th birthday when I could get my ears pierced. The girls at the piercing store let me select earrings (hypo-allergenic stainless steel hearts). They drew dots on my ears with a marker, placed the ear-piercing gun on my ears, and pulled the trigger as I struggled to hold back tears. It was done. And I LOVED it! My ear piercing dreams finally came true. The infections and pain in my new ear holes started a few days later. Little did I know the sleeping beast had been awakened. My toxic relationship with nickel began. Nickel is a common allergy affecting an estimated 15-25% of women and 8-10% of men. And you’ll be surprised at all the things that contain nickel (more on that below). For people who suffer from this allergy, our immune system views nickel as a harmful substance. Once you develop a nickel allergy, you will always be allergic to it and subject to an immune system response whenever exposed. 1. Avoid exposure to common items which can contain nickel. Before freaking out at this crazy long list of common everyday items, know one thing: all of these items don’t always contain nickel. It depends on the metal alloys used during the manufacturing process. Nickel is a common filler in metal products because of its strength and durability. It took me forever to figure out why some bra hook closures without a piece of fabric covering them gave me rashes on my back. Or why eyeglasses with metal frames made my ears itch. Or why the beautiful 14kt white gold earrings my husband gave me as a gift made my ears throb in pain. If you’re a jewelry lover like me, there are lots of beautiful nickel-free options available. For fine jewelry, stay away from white gold which frequently contains nickel: stick with platinum, sterling silver or most 14kt gold. Or for more affordable everyday designs, look for products or lines that are nickel-free (I offer a jewelry line with many nickel-free products including every pair of earrings offered). If you’re dealing with a chronic rash or suspect a reaction to something metal you already own such as scissors or a zipper or the metal on your garden hose, you can test for nickel with a nickel testing kit. Whenever possible, avoid nickel exposure if you suspect you have a nickel allergy. 2. Prior to any major surgical procedure involving a medical device, get your blood tested for a nickel allergy! She was right on both accounts. 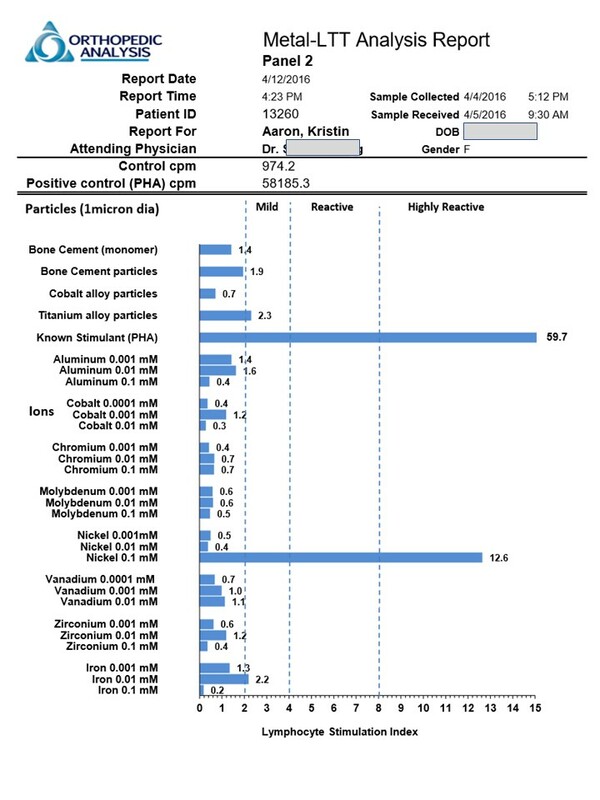 Insurance does NOT as standard practice approve patients being blood tested for metal allergies prior to having a device/plates/screws put in their body. I did it anyway, and it turned out to be money well spent as my results revealed a SEVERE nickel allergy. After seeing these results, my doctor changed my neck surgery procedure from an artificial disc (which all contained nickel in 2016) to a cervical fusion with titanium plates and screws. I still give thanks to God for a nurse who will never know she likely saved my life. Side note – given my test results revealed a major nickel allergy, insurance did eventually pay us back for the approximately $500 metal blood test. 3. Consider changing your diet. This one threw me for a MAJOR loop. Many foods contain nickel too?!? For over fifteen years, I’ve struggled with odd symptoms such as severe arthritis (especially odd since it started in my early 30’s), mystery rashes, and what I’d describe as an overall weakened immune system. Through the years, doctors have run tests for all kinds of autoimmune disorders like Lupus, Lyme disease, Fibromyalgia, and many others with no answers. Recently I considered trying acupuncture for relief and decided to research whether acupuncture needles contain nickel. Yes, they do unless you order special nickel-free ones. But that internet search would change my life as I came across article after article highlighting foods high in nickel. The biggest culprits consisted of staples in my diet: beans, nuts, soy, wheat/oats/rye/millet/buckwheat, chocolate, tea, and canned foods. I called my husband in a bit of a panic. “I’m kinda freaking out right now,” I told him as I shared the highlights from the articles. But he turned out to be right. After almost a year on the low-nickel diet, the results are remarkable. My arthritis pain is almost gone (unless I accidentally eat something high in nickel at a restaurant where all the ingredients aren’t listed), and my immune system functions better than it has in over 15 years. I feel like I got my life back. Switching to a low-nickel diet took a bit of time and testing, but I found a website and chart by Rebelytics which helped guide the journey into the land of the low-nickel diet. Generally if I eat a gluten-free diet and stay away from beans, soy, nuts, tea, canned goods, coconut and chocolate, I feel great. Yes, it is a bit high maintenance. And yes, I still dream about chocolate covered almonds. But it’s a small price to pay for getting your health back. For anyone suffering from a nickel allergy, there is hope. You can feel good again. Don’t let nickel ruin your life. I have a severe nickel allergy, from age 11 any jean studs that touched my skin, metal bracelets, or earrings made from metal alloy’s touched my skin it was like I’d been attacked by mosquitoes and the scratching started within 30 mins. Does my skin not know I’m a pauper??? Nickel allergies know no bounds. I feel your pain. And clear fingernail polish never works for me. Sometimes I can take a little piece of wax and cover it up. Wow, I had no idea. Thank you for the information, Kristin! Yes! Send new blog posts directly to my inbox. Yes! I want to save 25% on my next jewelry purchase.